From Route 1, turn onto Campus Drive. Follow Campus Drive until the traffic circle around the M.
Take the first right off of the traffic circle onto Regents Drive. Take the next left onto Field House Drive. Regents Drive Garage will be on your right. To get direction to the Regent Parking Garage, route to 1997 Field House Dr, College Park. There is visitor parking on the top floor of the garage. Remember your parking space number (you need it to pay when you park, and later to add more time if needed). Parking is $3.00/hr ($15/day maximum on weekdays.) (Warning: The parking pay machines are fairly poorly designed, and it is easier to pay with a credit card.) 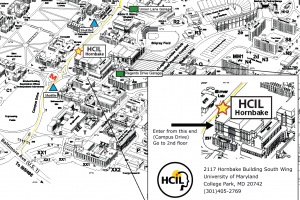 From the top floor, take the stairs or elevator to the third floor, then walk across the pedestrian bridge that connects the Regents Drive Garage to Hornbake Plaza. 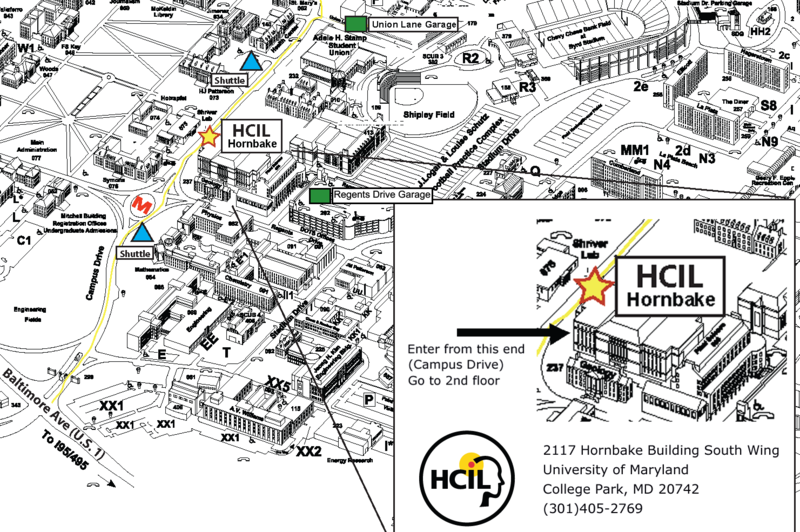 The HCIL is in the Hornbake Classroom Building (south wing). Don’t go into the actual library part—you’ll need to go into the entrance at the side of the building facing the Campus Drive. If you take the elevator to the second floor, walk through the large glass doors—the lab and offices are to the right. Details about reaching us by air or rail, as well as information about hotel accommodations, are available here.